Crossword puzzles are popular with all age groups, whether young or old. 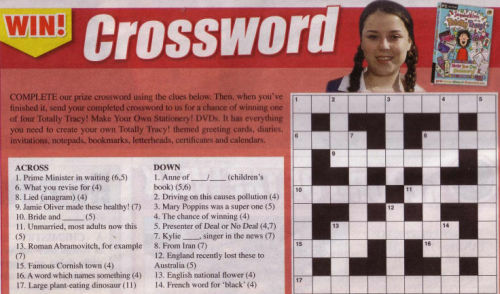 We can supply Children's crossword puzzles based on general knowledge, particular themes (such as current affairs, sport...) or a theme of your choice. All Children's crosswords will be supplied in your choice of PDF or EPS format, ready for print publication, and all Children's crossword puzzles we supply come licensed for publication. Simply Contact Us with your Children's crossword requirements, and we'll swiftly get back to you with a response and quote. Please note: if you are an individual looking for children's puzzles to play we recommend the Childrens Puzzles website.